Heat oven to 350°F. Grease bottom only of 8x4- or 9x5-inch loaf pan with shortening or cooking spray. In large bowl, beat all ingredients except nuts with electric mixer on low speed 30 seconds. Beat on medium speed 45 seconds, scraping bowl frequently. Stir in nuts. Pour batter into pan. Bake 45 to 55 minutes or until toothpick inserted in center comes out clean. Cool 10 minutes. Loosen sides of loaf from pan. Remove from pan to cooling rack. Cool completely, about 1 hour. 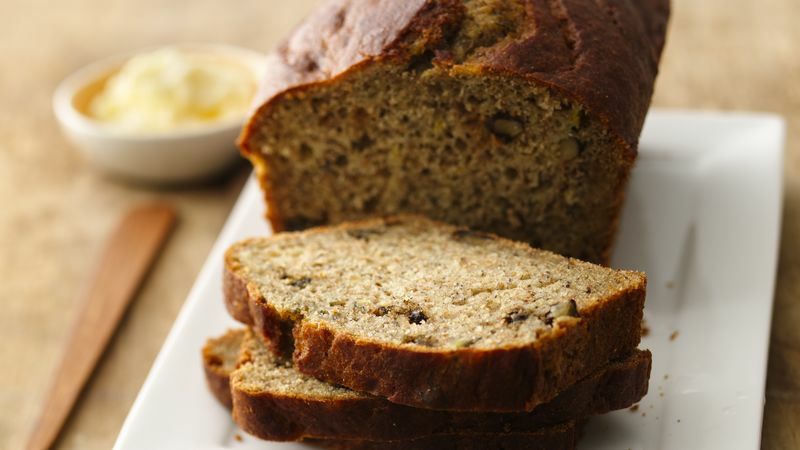 You can make this recipe with 1 1/2 cups all-purpose flour, and omit the whole wheat flour. For the best flavor, use bananas that have lots of brown specks on the skin and are slightly soft.